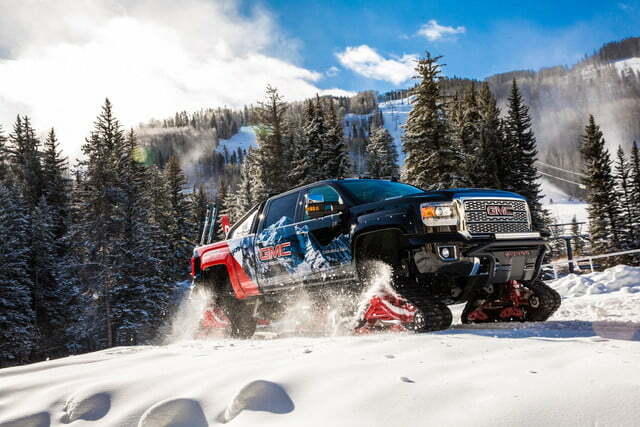 When it comes to conquering winter, it’s hard to argue with a heavy-duty pickup truck equipped with tank tracks. 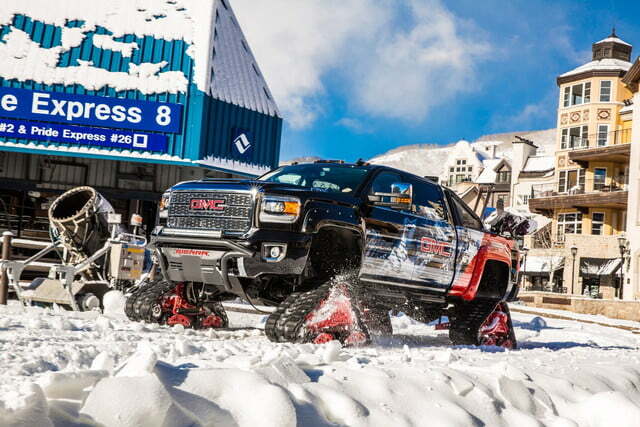 That’s what GMC just unleashed on Colorado’s Vail Mountain. 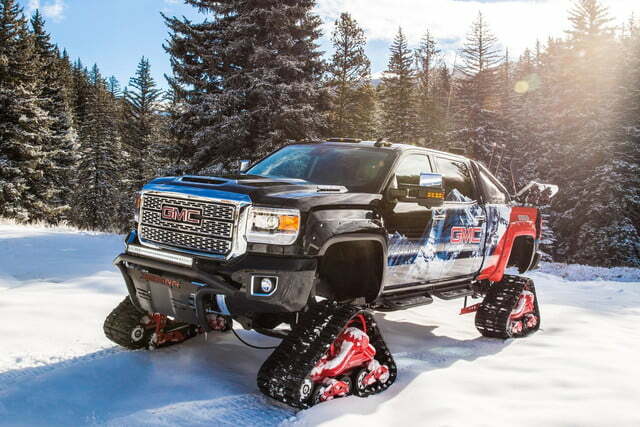 The GMC Sierra All Mountain concept is a modified Sierra 2500HD Denali crew-cab pickup truck. It left the factory with four-wheel drive, but the description is no longer accurate. That’s because the wheels were replaced with tracks from Mattracks, a company that specializes in tank-like tracks that can be retrofitted to regular vehicles. The tracks fit around the stock wheel hubs, so as long as the stock wheel wells provide enough clearance, there is no need for any other modifications. 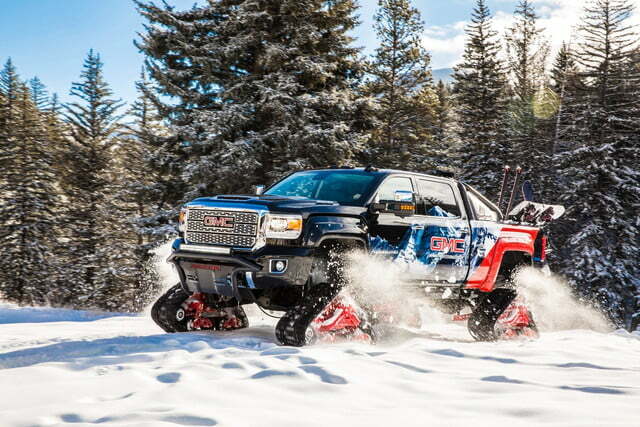 GMC isn’t the first automaker to fit these tracks to a show vehicle to attract attention and, given how straightforward the conversion is, the General Motors division probably won’t be the last. 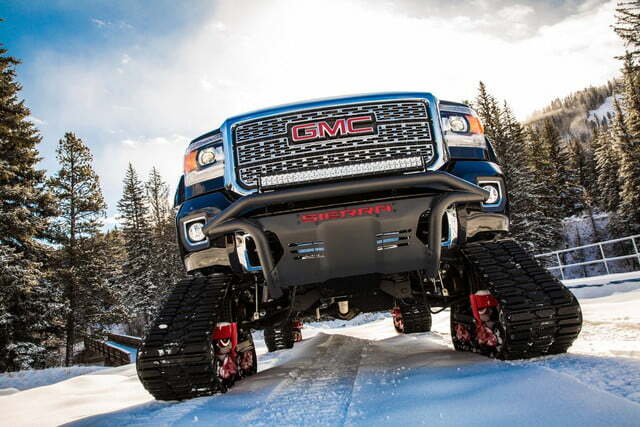 The All Mountain concept is powered by the same 6.6-liter Duramax turbodiesel V8 found in stock Sierra HD trucks. This muscular motor produces 445 horsepower and 910 pound-feet of torque, which is channeled to the ground through an Allison six-speed automatic transmission. Introduced for the 2017 model year and shared with the Chevrolet Silverado HD, the Duramax V8 is GM’s latest salvo in pickup truck wars. 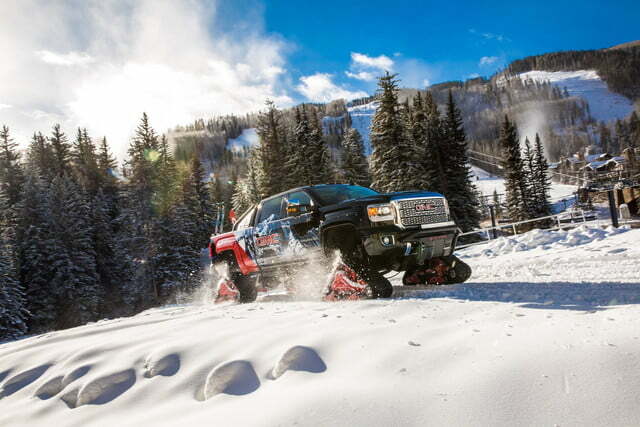 While it does have five more hp than the 6.7-liter Power Stroke turbodiesel V8 in the Ford Super Duty, it can’t match Ford’s 925 lb-ft of torque. 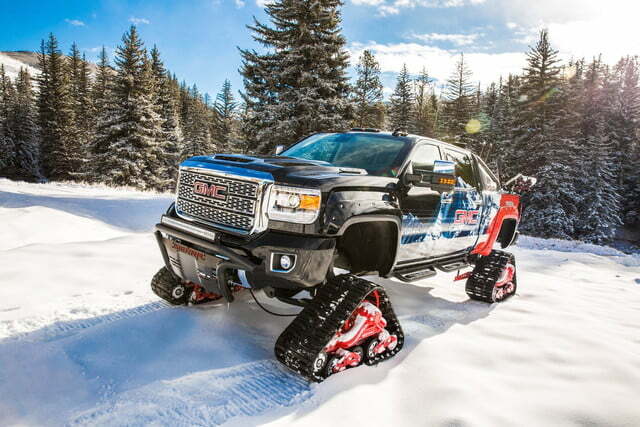 Since the All Mountain concept is based on GMC’s glitzy Denali trim, it also gets niceties like leather seats and a high-end Bose audio system so you can go Bigfoot hunting in comfort. As a bonus, the big shiny grille that differentiates Denali models from lesser GMCs should make a good reflector for signaling rescuers if you get stranded. 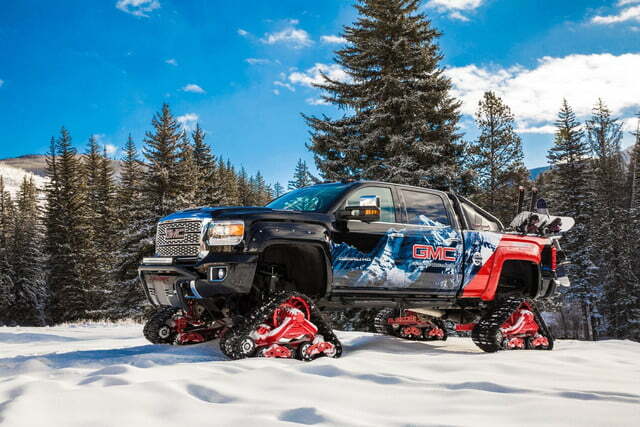 GMC won’t be offering tank tracks as a factory option on the Sierra anytime soon. 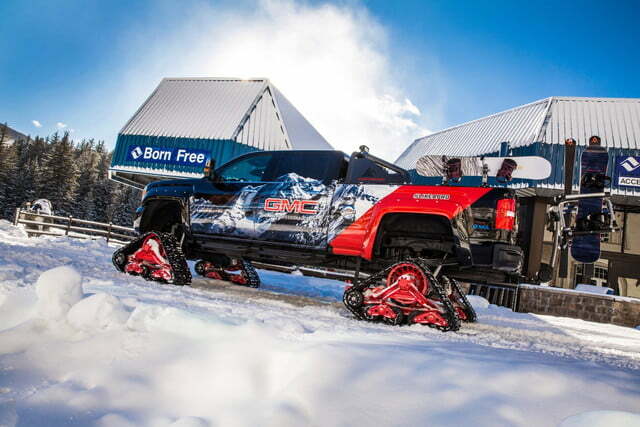 The Sierra All Mountain concept was built just for show, and to highlight GMC’s relationship with Vail Resorts. 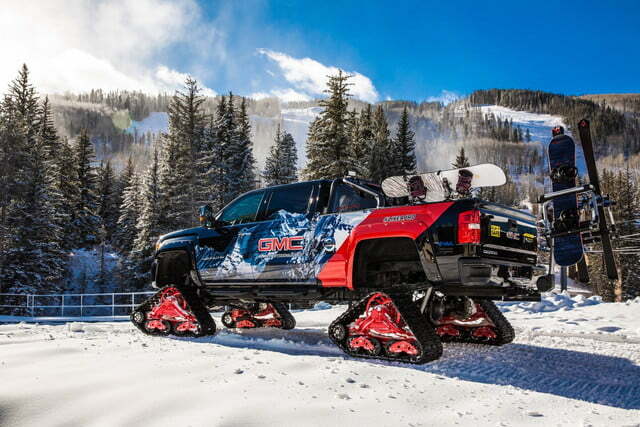 The original truck will be displayed in Vail over the winter. A second vehicle, based on the Sierra All Terrain X trim level, will be displayed at the 2017 Los Angeles Auto Show, which kicks off later this month. If you want a truck you can actually find at a dealership, the 2018 Sierra 1500 may have to suffice.